Using algae ecological on the surface of building . This project was presented on the EXPO Milano 2015, It is a new vision of future bio-digital architectures powered by micro-algae. This project presented a 1:1 scale prototype of the world’s first bio-digital canopy with the bio-reactor facade. The algaein the bio-reactor facades grows faster in bright sunlight to provide more internal shading. The ‘bio-reactors’ not only produce biomass that can subsequently be harvested, but they also capture solar thermal heat – and both energy sources can be used to power the building. 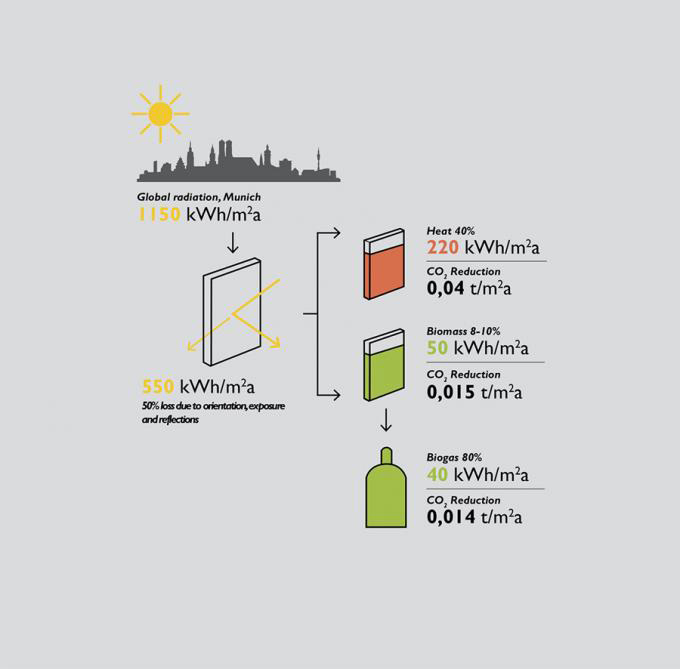 This means that photosynthesis is driving a dynamic response to the amount of solar shading required, while the micro-algae growing in the glass bio-reactor facades provide a clean source of renewable energy. Through recycling the algae in digester generate biofuel and biogas.Some biogas could provide energy for transport.Some biofuel could stored in the fuel cell and convert the bio-energy into electric energy used in the house or fed into the local power network, or alternatively, stored underground temporarily. This project was presented on the EXPO Milano 2015, It is a new vision of future bio-digital architectures powered by micro-algae. This project presented a 1:1 scale prototype of the world's first bio-digital canopy with the bio-reactor facade. 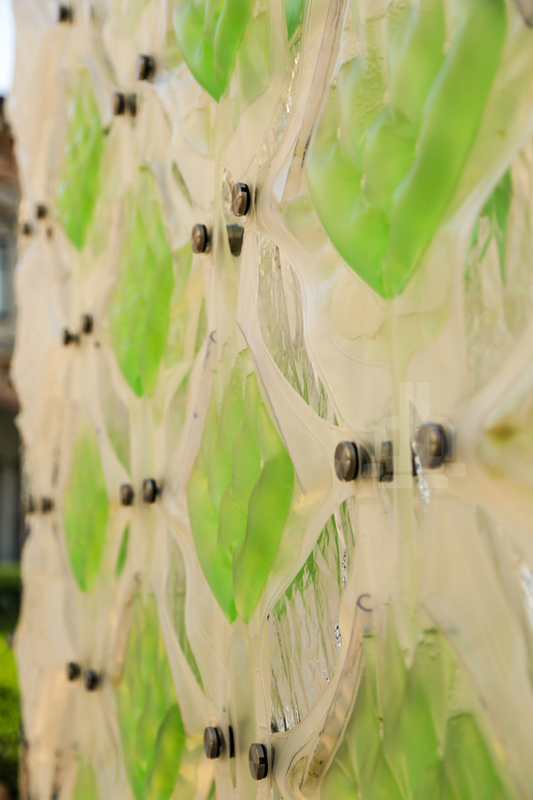 The algae in the bio-reactor facades grows faster in bright sunlight to provide more internal shading. The ‘bio-reactors’ not only produce biomass that can subsequently be harvested, but they also capture solar thermal heat – and both energy sources can be used to power the building. This means that photosynthesis is driving a dynamic response to the amount of solar shading required, while the micro-algae growing in the glass bio-reactor facades provide a clean source of renewable energy. Through recycling the algae in digester generate biofuel and biogas.Some biogas could provide energy for transport.Some biofuel could stored in the fuel cell and convert the bio-energy into electric energy used in the house or fed into the local power network, or alternatively, temporarily stored underground. Since 1978,the United States began the aquatic plant program (ASP),they hope to be able to extract clean biodiesel from algae instead of gasoline.But until 1996, a scientist called Wessels discovered a kid oil-producing algae ,and then convert biological oil into biodiesel. However,it was beginning in 2012 to use the algae on the surface of building in Germany.The Algae House by SPLITTERWERK， The first algae bioreactor façade world-wide was realised in the frame of the International Building Exhibition (IBA) in Hamburg in 2012 and 2013. The project is a multi-storey residential building that employs a prototypical method of producing energy and regulating light and sun-shading. 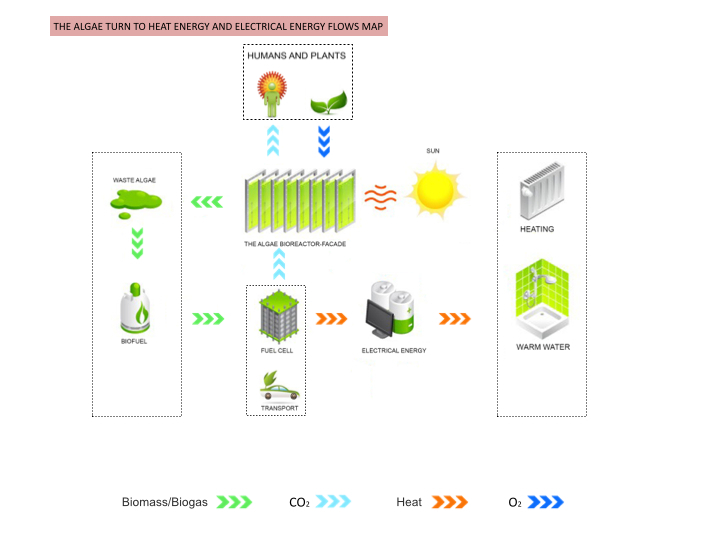 As long as there is plenty of water, carbon dioxide and sunlight, algae can absorb sunlight heat and rapid growth, to provide hot water for houses and reduce indoor temperature, and when the algae growth to a certain extent will be recycled, used for power generation, make full use of the biomass.As a “Smart Material House”, it combines intelligent materials and technologies with new typologies of living. 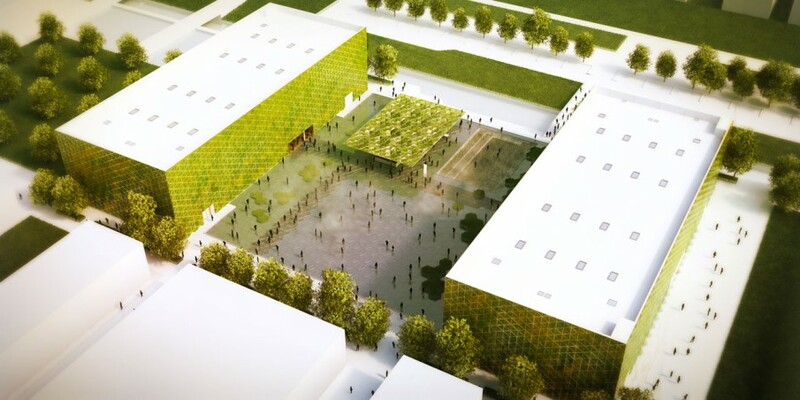 On one hand, after completed as part of EXPO2015 future food District the Urban Algae Canopy produced the oxygen equivalent of 4 hectares of woodland and up to 150kg of biomass per day, 60% of which are natural vegetal proteins. 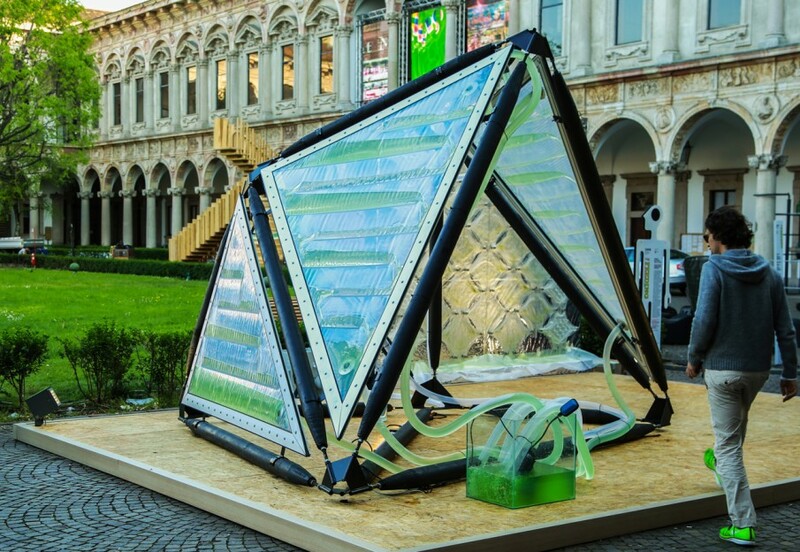 On the other hand,the designers want to through this kind of apparatus with using the algae bioreactor-facade on the surface of building to promote the idea of the conception of building integrated farming and urban agriculture . 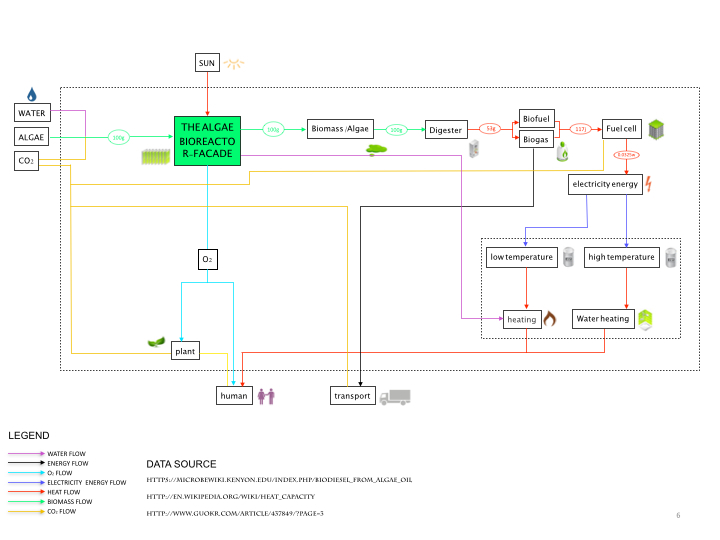 This project became a milestone to create a new value chain and plays an important role in establishing surplus energy and zero carbon building clusters for the future. 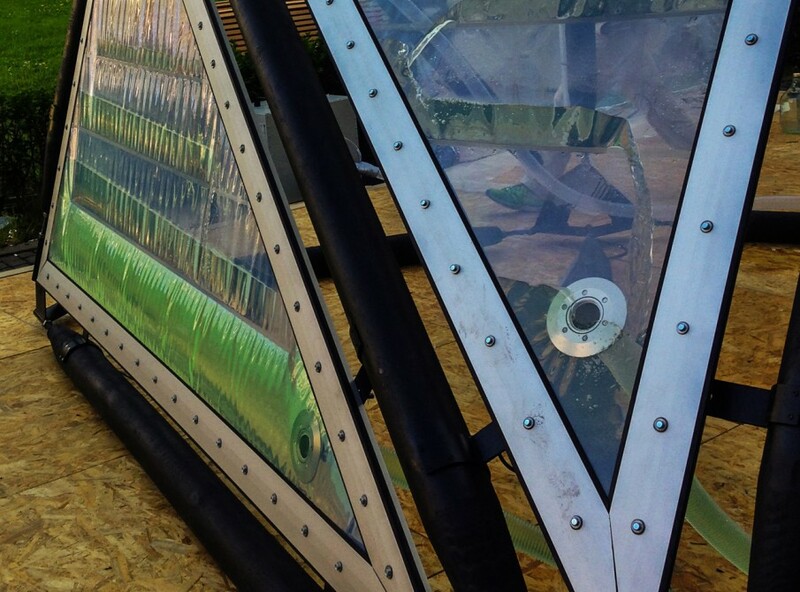 Using the algae bioreactor-facade on the surface of building, not only can help for both heat-insulating and soundproof ,but also can saving space in the city area. 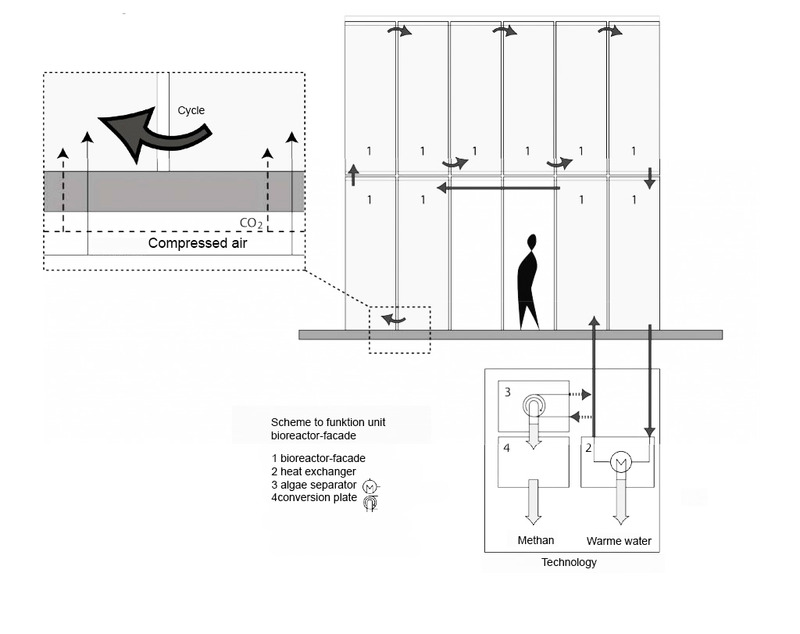 At the same time,make the building itself to be a part of the urban energy recycling systems. 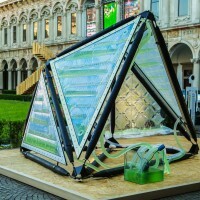 Urban Algae Canopy provides a concept of using new environment-friendly materials on the building and encourage people try to use the accessible green reusable resources in future. Using bio-reactor facade on the surface of building, could reduce indoor temperature so that saving money for electricity of air conditioners,at the same time, the recycling algae could produce biofuel and converted into electricity.